What is your go - morning or afternoon beverage? You probably have heard me talking about alkaline coffee, alkaline water, and alkaline teas....notice a trend? lol. 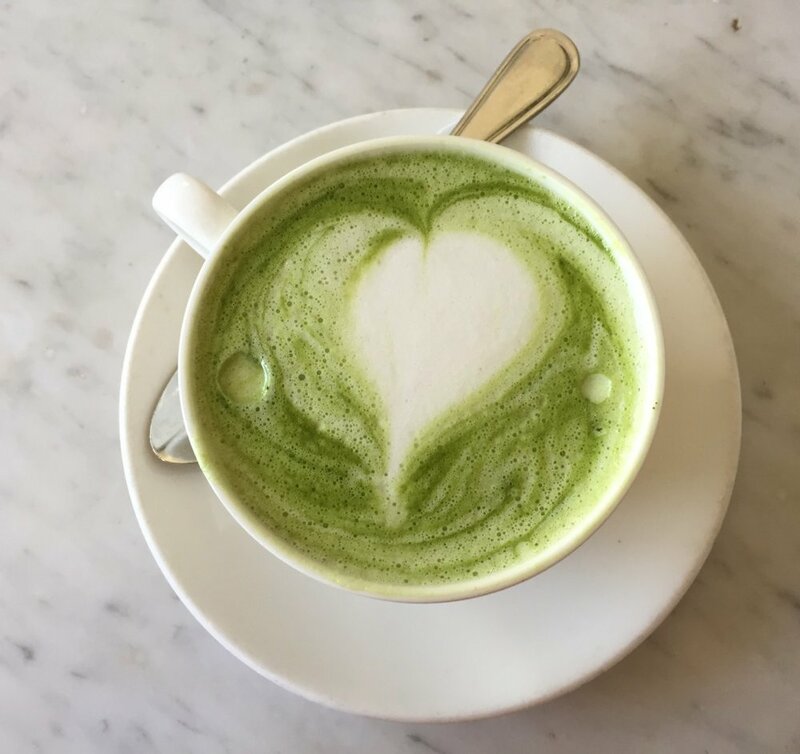 But I started drinking matcha tea before I left for LA and then was over the moon when I found so many restaurants there who were serving this little beauty! Yes, you got it. It's Matcha Tea! This is what I ordered on Saturday when I was out for lunch at Cafe Gratitude in Venice. It was delicious and amazing, and I had just ordered some Matcha to make for my own lattes at home. I got mine from Thrive Market online and have the brand, Matcha Love Organic Stone powder. It's high in L-Theanine, an amino acid found predominantly in shade-grown green teas that historically have been used in aid of meditation due to their calming effects. This particular brand is grown in Japan. It doesn't cause you to crash like caffeine and has up to 5 times more L-Theanine than a green or a black tea does! I simply brewed hot water in my tea kettle this morning and whisked it into my hot water and added unsweetened vanilla flax milk and some organic liquid stevia. Delicious and can I just say YUM! Don't you just LOVE how healthy makes you happy?!? So this week I challenge you to order some matcha, from a tea shop or online and start to add it to your healthy habits. It's yet another GREEN food that is so good for you, and remember that we want to eat to fuel our cells! If you are considering my group Leap Food Sensitivity Master Class, click on the link below to chat with me about it! I have 3 spots left and this is the last time this program will be offered at this intro group rate!